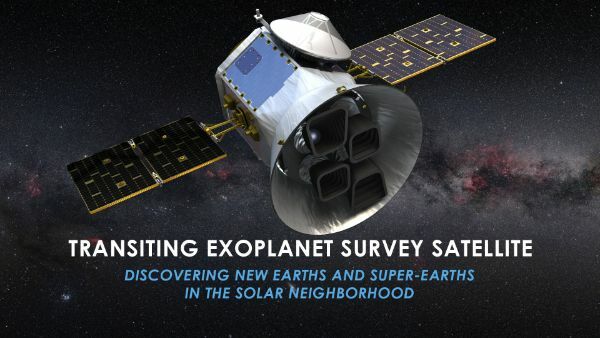 Arising from its measurement requirements, NASA’s Transiting Exoplanet Survey Satellite (TESS) will operate from a previously unused highly elliptical orbit varying between 17 and 59 Earth radii in altitude which will provide the spacecraft with long, uninterrupted observation arcs to conduct its exoplanet hunt while also creating a benign thermal and radiation environment as it keeps out of the Van Allen Belts. But reaching this orbit will represent one of the largest challenges for the Explorer-class mission given its limitations in maneuverability due to the constrained spacecraft mass. 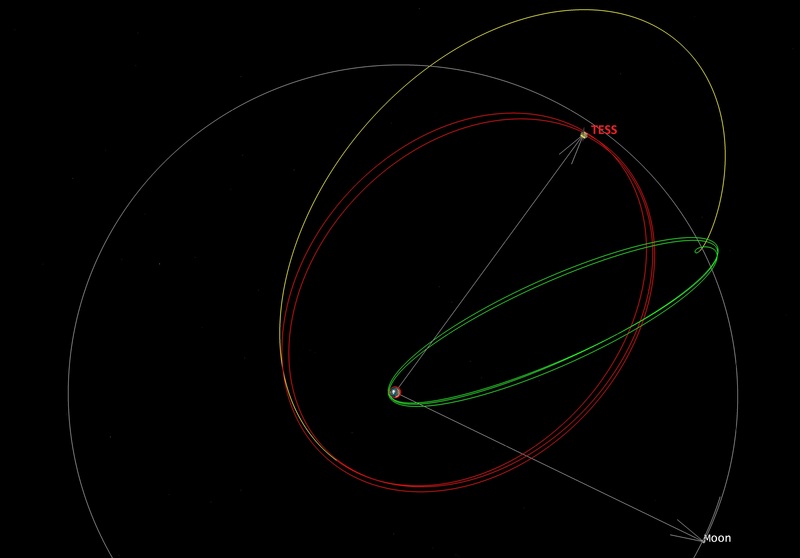 This particular orbit was chosen for TESS for a number of factors, considering the operational aspects of the mission but also trading off between mission cost and science return. The operational orbit brings TESS sufficiently close to Earth for high-data-rate communications while also possessing a period sufficient for long, uninterrupted observations that are needed to maximize the odds of detecting exoplanet transits. Furthermore, the chosen orbit offers a very benign radiation environment since it is fully outside the Earth’s radiation belts and the spacecraft will not experience any major thermal changes which is a key requirement for its detection sensitivity. This exact orbit, known as a P/2 orbit for its resonance characteristics, has never been used before, but the fundamentals are well understood and practical knowledge exists from the Interstellar Boundary Explorer mission that operated from a P/3 orbit. TESS will reach its orbit through a complex flight design featuring up to eleven burns of its orbit maneuvering engine plus a critical lunar flyby – creating around 60 days of maneuvering to place the spacecraft into its operational orbit. This complex design comprising 3.5 phasing loops before the lunar flyby is a result of the mission’s constrained delta-v budget. Further complexity is added by a number of operational requirements like a maximum of 16 eclipses with a maximum duration of five hours, no direct solar illumination into the four wide-field cameras for more than 15 minutes during any of the engine burns, and a post-mission requirement of having TESS stay clear of the Geostationary orbit radius for several decades. Additionally, orbital injection of TESS can only occur at an argument of perigee between 150 and 235 degrees in order to perform the injection burn and spacecraft separation within range of African tracking stations. Also, the mission design has to be set up in a way where risk is manageable – allowing ample margin for injection errors by the launch vehicle and time for calibration of the spacecraft’s maneuvering engine. Another driver of the mission design was avoiding single-point failures such as a loss of mission in the event a single propulsive maneuver is missed due to a spacecraft issue. The SpaceX Falcon 9 rocket will launch the 362-Kilogram TESS spacecraft into a Suprasynchronous Transfer Orbit of 200 by 270,000 Kilometers at an inclination of 28.5 degrees. This orbit may be susceptible to solar and lunar perturbations which may result in the orbital perigee lowering into Earth’s atmosphere over the course of the craft’s first revolution – requiring a corrective maneuver at the first apogee. This planned 54-second, 4-meter-per-second burn of the 22-Newton orbit maneuvering engine will lift the perigee to 600 Kilometers while also doubling as a calibration firing of the main engine to aid planning of future maneuvers through the collection of real world performance data. At A1M, the Moon will be in front of the spacecraft and its gravity will provide a slight tug and further speed up the vehicle to ensure the perigee stays well clear of the atmosphere. 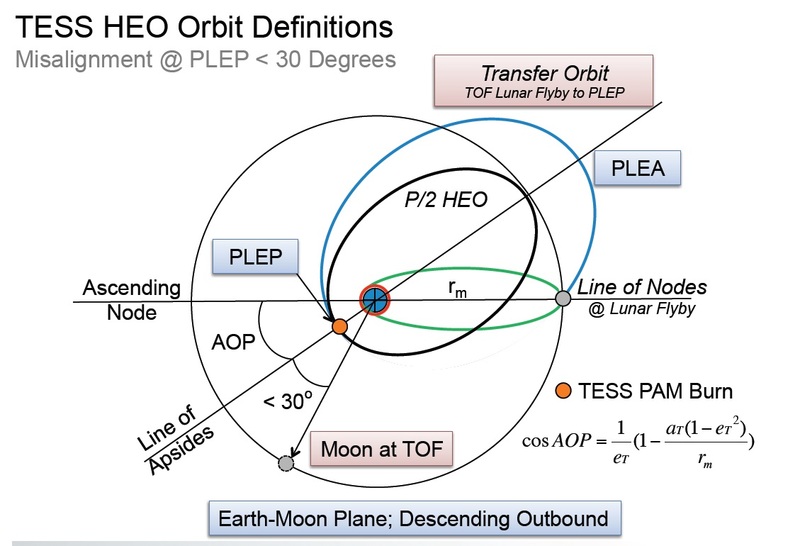 After the A1M maneuver, TESS will coast back to perigee where it will execute a major apogee-raising burn, dependent in magnitude on the craft’s launch date and the relative geometry required to set up the lunar flyby. Per the standard mission design, the burn will vary between 28 and 50 meters per second, lifting the apogee to 375,000 Kilometers. The A2M apogee maneuver will again have the objective of keeping the perigee above 600 Kilometers. 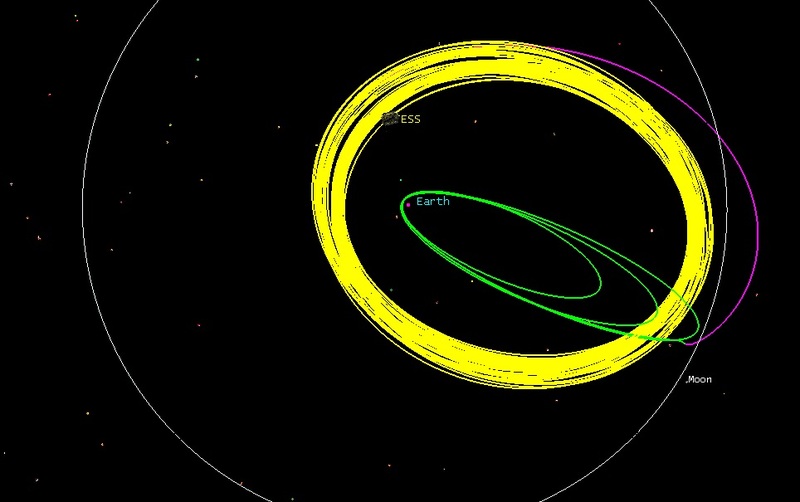 The subsequent two perigee maneuvers, P2M and P3M, are used as fine-tuning maneuvers to set up the precise orbital period needed to intercept the lunar flyby window at Apogee #4 of the mission. 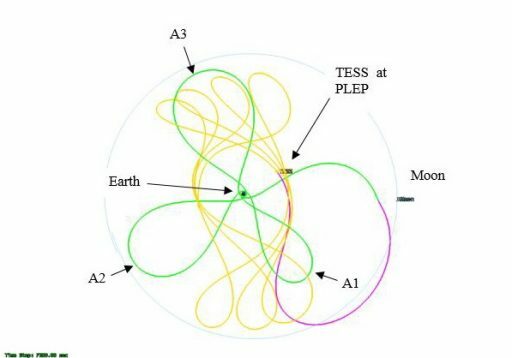 In some trajectory cases, P2M could be a significant maneuver, but the desire will be to launch TESS into a geometry that allows P1M to lift the apogee to near lunar distance and have P2M and P3M at near zero, only acting as fine-tuning maneuvers since any significant errors at P2M will lead to a large delta-v burn at P3M to correct for the error in orbit period. Trajectory Correction Maneuver slots are available before and after P3M to set the spacecraft on the precise course for the lunar flyby. The flyby itself takes TESS to a distance of around two lunar radii and the resulting deflection in the craft’s trajectory will be fourfold: a) lifting the apogee to around 75 Earth radii, b) raising the perigee to 17 Earth radii, c) increasing the orbital inclination to 37° and d) raising the ecliptic inclination to avoid long eclipses. A critical condition that has to be satisfied will be a resulting apogee of less than 90 Earth radii. The orbit after the lunar flyby will still require tweaking to put TESS where it needs to be, initially realized via a significant Period Adjustment Maneuver (nominally 54m/s) occurring on the next perigee pass to set the orbit apogee such that the orbital period reaches 13.65 days in the desired 2:1 resonance with the Moon’s orbit. 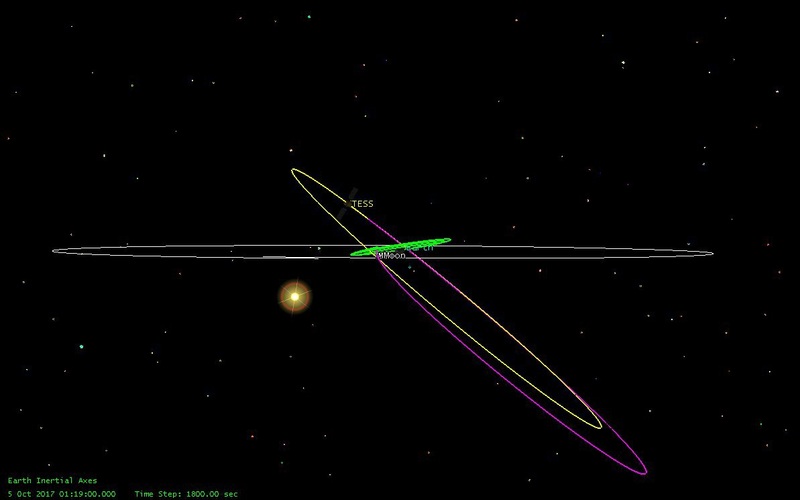 A final Trajectory Correction Maneuver is available on the second post-flyby perigee to correct dispersions from the Period Adjust Maneuver and place TESS into an orbit that is expected to be stable for at least 20 years. 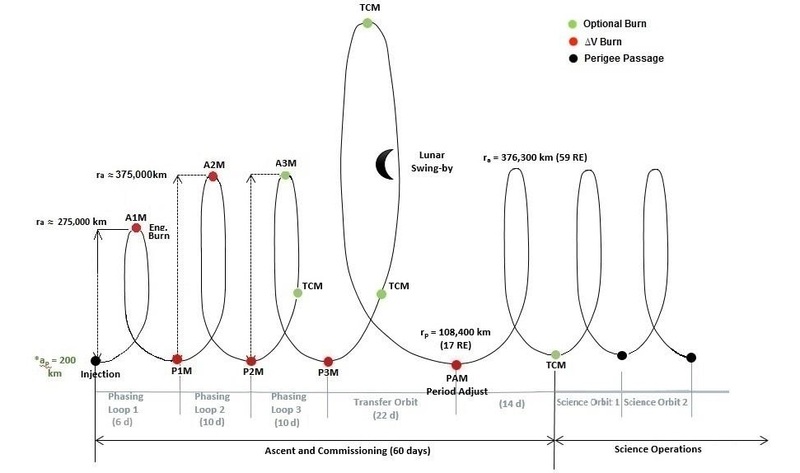 The total delta-v budget for orbit maneuvers is 215 m/s (80% of the mission’s total available dV) and includes 150 m/s for deterministic maneuvers, 25 m/s for launch vehicle injection errors, and 40 m/s for non-launch vehicle dispersions such as solar pressure and performance fluctuations on the engine. If TESS receives an on-target or slightly above nominal orbit insertion by the Falcon 9, a theoretical mission duration in excess of 15 years would be possible from a consumables standpoint. 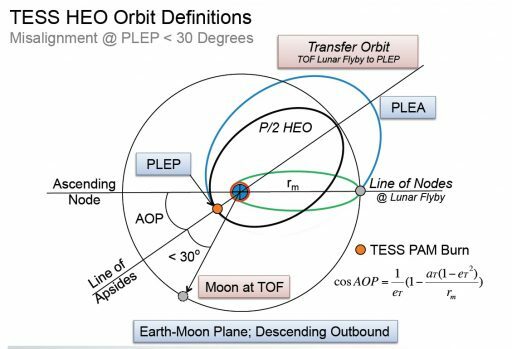 The operational orbit of the TESS mission will be subject to periodic oscillations in eccentricity, inclination and ecliptic argument of perigee. These oscillations, driven by a Kozai-like mechanism, will occur on a period of around eight to twelve years and manifest in an exchange between eccentricity and inclination (also causing the orbital period to oscillate by as much as one day over the course of the Kozai cycle). Shorter-term oscillations on a time scale of around six months will be caused by solar perturbations. 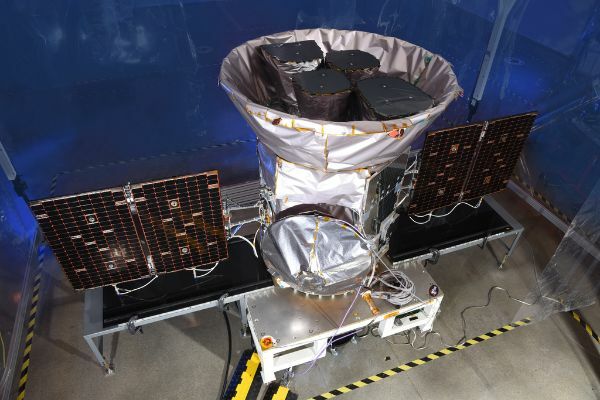 Despite these oscillations, the TESS operational orbit is considered stable over long periods of time and will not require Stationkeeping maneuvers from the spacecraft. 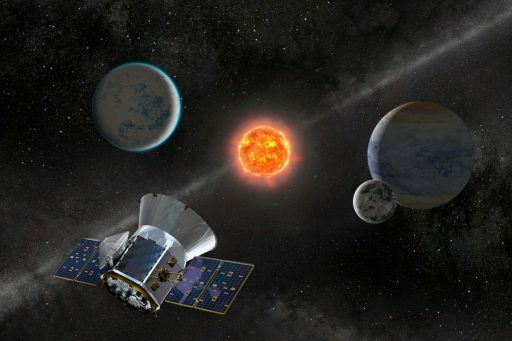 However, TESS will regularly expend propellant for unloading of its four Reaction Wheel Assemblies as a result of momentum build-up from countering solar pressure. Because of the large number of constraints and high variance in starting conditions found in the relative geometry of the initial orbit and the Moon, trajectory designers developed an automated trajectory design algorithm that takes into account the spacecraft parameters, error statistics, force models and the various constraints like eclipses, upper boundaries for perigee, apogee and period, etc. 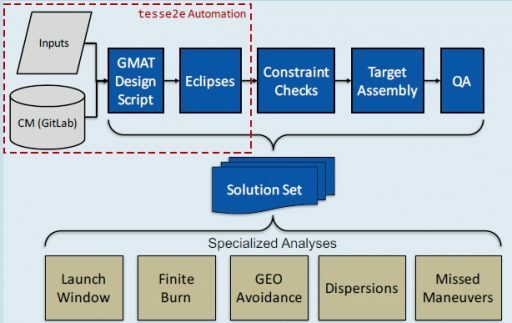 The automated process delivers an optimized solution for each feasible launch date which is then put through a Quality Assurance process to verify that all requirements are satisfied – creating five discrete launch windows per month, each between one and four days in duration. 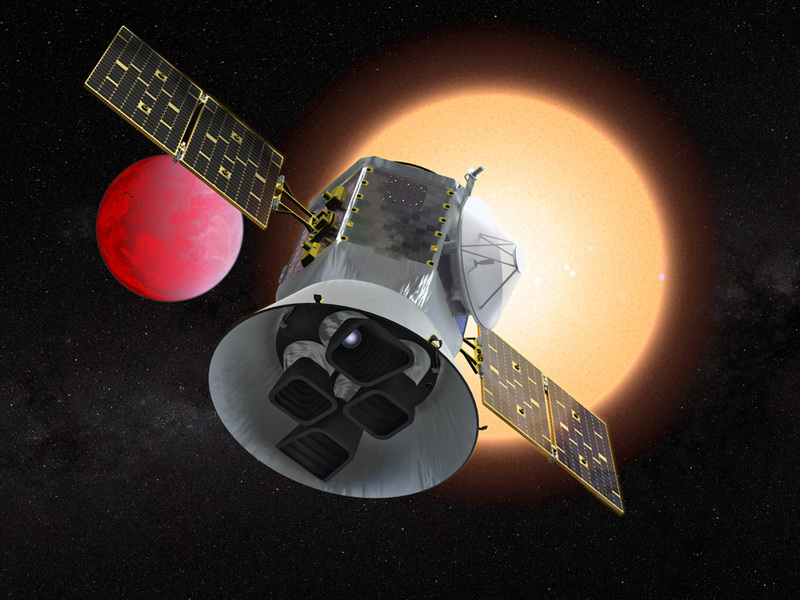 The TESS commissioning phase has the goal of turning on the various instrument systems and demonstrating the spacecraft’s capabilities in a methodical fashion to ensure it will be ready to deliver high-quality science data once operational services are initiated. Commissioning activities will be completed in parallel to phasing loops/trajectory maneuvers and TESS is expected to be ready for science operations 68 days after launch. 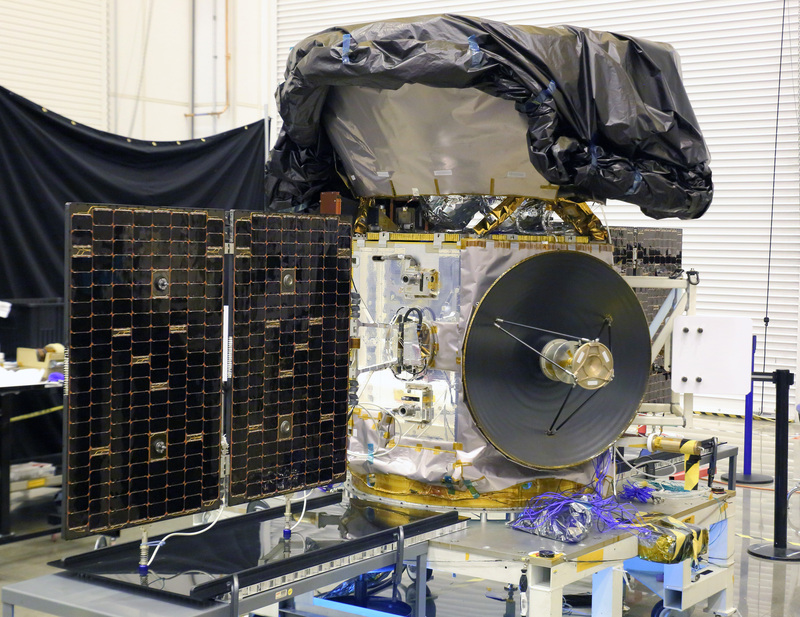 Commissioning activities begin shortly after launch with an initial health check of the various satellite platform systems before the instrument undergoes initial checks, fine pointing updates and instrument calibration. The first major step will be the initialization of the spacecraft to ensure the communications, data handling and attitude control systems are functioning properly. These checks include the two S-Band transceivers, star trackers and the reaction wheels and ACS thrusters. The platform checkout is expected to be complete by Day 7 of the mission. The second commissioning phase covers the activation of the four WFOV cameras, completed one by one, and the initialization of the Data Handling Unit followed by a functional check and collection of first light imagery. This phase also covers the initial alignment of each camera to transform the in-orbit boresights into the spacecraft reference frame. Starting around Day 10 of the mission will be the third commissioning phase to test out the fine pointing control mode, perform a test of the onboard cosmic ray mitigation and collect the first set of Full Frame Images from the cameras. After the Fine Pointing Phase, around Day 16 of the mission, the first target pixel masks will be uplinked to the spacecraft along with a guide star table for continuing fine pointing exercises and initial postage stamp acquisition. An assessment of scattered light will allow for additional calibration and the camera detectors will be characterized by imaging bright stars. 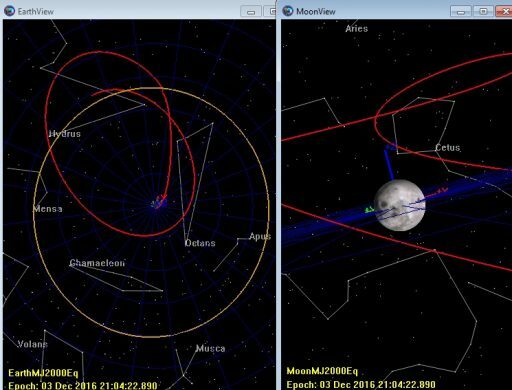 A brief cut-out of commissioning activities occurs around the lunar flyby. The science instrument should be fully calibrated by Day 55 of the mission, to be followed by a full science checkout orbit to validate the performance of the spacecraft and instrument as well as the data downlink and ground processing chain prior to pressing into the systematic all-sky survey on Day 68 of the mission.